ArubaHouse: More Things to See! Although Aruba experiences a very dry climate generally, there are a few lush areas that are considered by local and migratory birds to be an oasis! A water treatment facility empties into two inter-connected man-made lakes, known as the large and small Bubali Bird Ponds. It is surrounded by a generous helping of lush vegetation and the area has become a resting and breeding area for more than 80 species of migratory birds. Birds that inhabit the sanctuary include herons, egrets, gulls, skimmers, coots, cormorants, numerous species of ducks and more. An observation tower has been erected to allow birdwatchers to get a true birds' eye view. Be sure to bring your binoculars and telephoto lens. Aruba's dry, desert-like rocky terrain is an ideal home to many four-legged animals, most notably, the mountain goat. 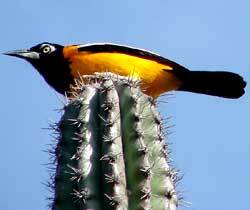 They are usually found near the rock formation of Ayo. 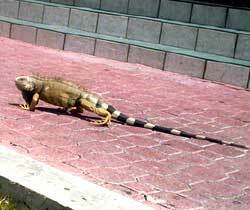 While driving the countryside, you will come across wild donkeys and many green lizards, such as iguanas. For birdlovers, the four San Nicolas Bay Keys located at the southeastern part of Aruba are major nesting sites for different tern species: sooty terns, black noddies, and brown noddies nest in or under buttonwood trees. Along the Bubali ponds in the northwest - a former salt-pan now an artificial freshwater wetland fed by the effluent of a waste-water treatment plant - buttonwood and white mangrove appear. Buttonwood growing along the Eastern shoreline of the larger lake, attracts brown pelicans and cormorants diving for food in the deep waters of this lake. 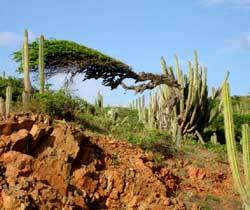 Aruba's favorite trademarks are inspired by the island's own natural vegetation. Rolling landscapes are robust with lush cacti, aloe and distinctively pointing divi divi trees. The climate and flora are typically classified as desert - an exotic panorama when coupled with the shimmering turquoise seas that inhabit virtually every horizon. Natural vegetation is celebrated in the beautifully appointed Arikok National Park, where nature walking tours are available to view the wildlife in the area. Maybe it's those big gentle eyes. Or the wacky grin and the ridiculous noise they make. Whatever it is, donkeys have a certain something that many people find completely endearing. 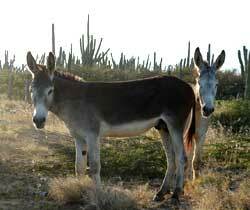 The Aruba Donkey Sanctuary takes in injured and sick wild donkeys, providing care and a permanent home. This is a great place to spend a couple hours, especially if you're an animal lover or a kid (and if you're not either, that may have changed by the time you leave!). The donkeys love visitors, especially those with a handful of carrots or apples. Before you leave, stop by the little refreshment stand for a cold drink or a unique souvenir T-shirt.